RODEZ Art Gallery presents Fact or Fiction an exhibition featuring the works of George Rodez, analyzing the relationship between real-life and dreams; representing the human struggle in understanding the incongruity of mans conscious and subconscious mind. This exhibit features a combination of surreal, abstract and expressionistic works of art, including three works from Rodezs Dream series first exhibited in Spain as part of a solo-exhibit entitled Dream Symptoms, and is part of a much larger collection currently traveling on exhibit throughout Europe. The exhibit will open during Coconut Grove Gallery Walk on Saturday, December 3 with a wine and cheese reception and will run through December 24. Coconut Grove Bank presents its 5th Annual Art Under the Stars Event on Thursday, December 1, 2011 at Coconut Grove Bank, 2701 South Bayshore Drive, 2nd Floor Lobby, Miami, Florida from 6 to 9 p.m. This group exhibition will feature local artists, including yours truly. Apollo Bank presents its Annual Teens Team-up Against Cancer Art Exhibit on Friday, November 18, 2011 at Apollo Bank, 1150 So. Miami Ave., Miami, Fl. from 6:30 to 8:30. The event will feature a George Rodez solo exhibition with a portion of all proceeds benefiting the Children's Cancer Caring Center (CCCC). The exhibit will be on view through November 29, 2011 during regular bank hours and proceeds from sales throughout the exhibit will benefit CCCC. It always gets me to do what it wants." "A painter is a man who paints what he sells. An artist, however, is a man who sells what he paints." Rodez believes that transition and flexibility are necessary elements in order for an artist to grow and remove themselves from a position of stagnation. As a result, Rodez is currently working on nine different bodies of work. Come and view the diversity that is George Rodez. Allow the work to speak to you and say what it may. View it with an open mind. It is a visual journey that can touch on many levels of the subconscious. Mona an Ode to Mona Lisa, a group exhibition. Opening Saturday, October 15 through November 12, 2011. Mano Fine Art is located at 4225 SW 75 Ave., 2nd Floor, Miami, Florida. The Mona Lisa continues to inspire reproduction, parody and more. Andy Warhol, Marcel Duchamp, Salvador Dali and Vik Muniz are among the many famous artists who have paid homage to La Giaconda and now a distinguished group of contemporary artists inspired by da Vincis iconic painting will pay tribute to what many believe to be the most famous painting in the world. The exhibition showcases a wide range of interpretations of the Mona Lisa by featured artists: Nestor Arenas, Jorge Ballara, Toa Castellanos, Vincente Dopico, Patrica Franco, Daniel Garcia, Chenco Gomez, Marcy Grosso, Mila Hajjar, Monique Lassooij, MANO, Tony Mendoza, Antonio Nunez, Valentina Ramos, George Rodez, Sandra Suarez, Fernando Sucre and Derek Wilson. RODEZart.com Gallery presents: "ART MACtown," a group exhibition featuring over 110 works of art by the patrons of MACtown, a 501(c)(3) charitable organization whose primary mission over the past 49 years has been to improve the lives and further the independence of people with intellectual and developmental disabilities in South Florida. 100% of the sales proceeds for the sale of these 10" x 10" pieces benefit MACtown. In addtion, artist George Rodez will feature artwork from his Elements & Values and his Afro-Caribbean series, in both originals and limited editions, which a portion of the sales proceeds will also go to benefit MACtown. 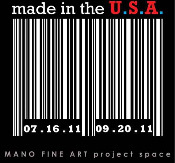 Mano Fine Art Project Space in Miami, Florida presents: "Made in the U.S.A.," a group exhibition, July 16 - September 20, 2011. Mano Fine Art is located at 4225 SW 75 Ave., 2nd Floor, Miami, Florida. daas Gallery in Fort Myers, Florida presents: "Personalities III," a George Rodez solo exhibition, June 3 - 26, 2011. Join me on opening night, Friday, June 3 from 6 to 10 pm at daas Gallery, 1542 Broadway Street, Fort Myers, Florida. RODEZart.com Gallery presents: "THE ORDER OF CHAOS," a Vicente Dopico-Lerner, Daniel Garcia and George Rodez group exhibition, May 7 - 30, 2011. In a world full of wars, natural disasters and uncertainties, it is refreshing to know that Chaos can sometimes also be a symbol of positivism and beauty. Three artists: Vicente Dopico-Lerner, Daniel Garcia and George Rodez come together to offer us just that through means of visual interpretation. With a sense of composition, form, enmeshed colors, straight and jagged lines, light and depth, these artists come together to bring order into the spoken word of Chaos. To view the work is to see the frenetic reality that life can sometimes be, but with the same token, it also offers us a sense of serenity and the beauty of knowing that life is exactly what it should be at all times. The vernissage will be held on Saturday, May 7, 2011 during Coconut Grove Gallery Walk from 7 to 10 p.m.
Gallery hours are Monday through Thursday, 11:00 a.m. to 7:00 p.m. and Friday and Saturday, 11:00 a.m. to 10:00 p.m.
"A Special Coconut Gove Arts Festival Exhibit" - Artist and Owner George Rodez exhibits works of art from his Afro-Caribbean and Elements & Values collections. Opening night is Monday, February 14, 2011. "Personalities I & II: an Exploration of the relationship between emotional states and art" - a George Rodez Solo Exhibition. Artist and Owner George Rodez exhibits works of art from his numerous and diverse collections, with each body of work emerging from different experiences and emotional states, allowing his personalities to come through while affording the viewer an insightful examination into the vast world of George Rodez. We celebrate opening nights on Friday, January 7, from 7 to 10 pm at the RODEZart.com Gallery in CocoWalk. The exhibition will run through Februry 12, 2011. Gallery hours are Monday through Thursday, 11 am to 7 pm, and Friday and Saturday, 11 am to 10 pm. The A. Cueto Gallery in San Juan, Puerto Rico presents their Christmas Exhibition, with participation by the gallery's represented artists and other invited artists. George Rodez will exhibit several of his latest creations in the Elements & Values series.